The iron in your diet plays a vital role in oxygen usage, growth and energy metabolism, and women under the age of 50 need 18 milligrams per day. Women over age 50 need 8 milligrams a day. In the United States, most refined grains are enriched with iron, meaning that iron is added to replace quantities of the nutrients lost during processing. The iron that enriches refined grains is non-heme iron, a plant-based form of this mineral that your body absorbs less easily than the iron in animal-based foods. Serve fruits, vegetables and other foods rich in vitamin C with iron-enriched products to improve iron absorption. During the milling process, grains lose most of their bran and germ, which contain the majority of the grain’s nutrients, including iron. Enriching grains with iron restores their nutritional content, according to the U.S. Department of Agriculture. Iron-enriched white bread can help people acquire this mineral. Sliced white bread, sandwich buns, pitas and flour tortillas contain iron-enriched flour, contributing to your RDA of this essential mineral. One slice of iron-enriched white bread gives you 0.9 milligram of iron – the same amount that a slice of whole-wheat bread provides. Many wheat cereals are not simply iron-enriched, but iron-fortified, which means that additional iron was added during processing to boost their nutritional content. You may appreciate the convenience and nutritional value of ready-to-eat wheat cereals and oatmeal. One cup of iron-fortified wheat cereal provides 18 milligrams of iron, which is 100 percent of the amount women under age 50 need on a daily basis. Spaghetti, macaroni and other pasta made from refined wheat flour are enriched with iron. If you need more iron in your diet, you may benefit from the added iron in these foods. One cup of iron-enriched spaghetti offers 2 milligrams of iron, which 11 percent of the RDA for women ages 19 to 50, and 25 percent of the RDA of 8 milligrams for women over age 50. Cornflakes, corn tortillas, grits and other products made with refined cornmeal may be enriched with iron. 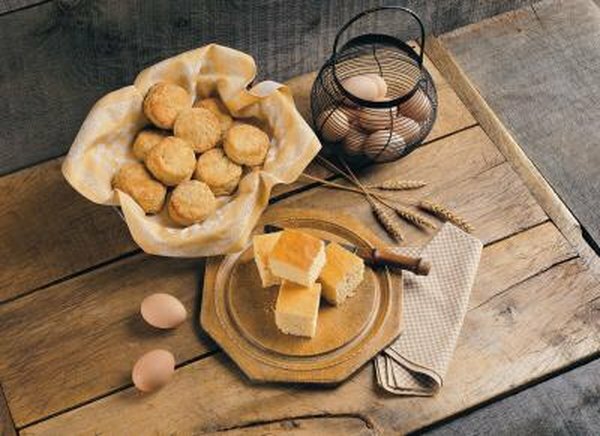 One cup of the enriched cornmeal you might use to bake cornbread or corn muffins offers 7 milligrams of iron. Check the nutrition facts labels on corn products and other foods made with refined grains to confirm their iron content. Like wheat and corn, rice loses nutrients during processing. One cup of enriched cooked long-grain rice has 2 milligrams of iron. You can add to your daily intake of iron by serving enriched rice as a side dish with meals. U.S. Department of Agriculture: Inside the Pyramid – What Foods Are in the Grain Group?